Guided by the power of light, Olafur Eliasson’s Contact exhibition at Fondation Louis Vuitton and Jeanne Gang’s glacial interpretation for Swarovski signals the reality of climate change with James Balog’s photography. 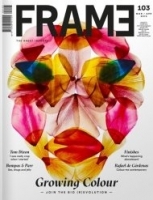 This issue’s Frame Lab explores the ways creatives are experimenting in labs or farming their own pigments. Sam Bompar and Harry Parr of London studio Bompas & Parr delve into their jelly-filled adventure as experience designers.